MOTHER of two Jacinta Rony was gunned down in broad daylight last Saturday at the Tolukuma gold mine in the Goilala district of Central province, The National reports. And grieving relatives are now claiming that mine owner Petromin is trying to sweep the killing under the carpet. Rony, 36, three months pregnant with her third child, died from gunshot wounds to the neck while a male employee was left unconscious by the criminals who had breached security at the mine site. Both were employed by Ipi Mountain Catering, the company which provides catering service to the mine as well as run the canteen to serve the surrounding community. Family spokesman Air Niugini pilot Captain Joseph Kumasi said yesterday that 48 hours after the killing, neither Petromin nor Ipi Mountain Catering had come forward to provide the family with an official account of what happened. Instead, the mine had emailed all its managers on Sunday not to talk to the media about it. The National could not talk to Petromin's corporate manager Sam Inguba who was on recreational leave while calls to managing director Joshua Kalinoe's office were referred to acting public affairs manager Babani Maraga who said a statement would be forthcoming. Kumasi was also concerned that Petromin did not have the courtesy to notify Rony's husband John Kaima, a mine employee who was on field break in Mt Hagen, of his wife's death. He added that her IPI colleagues at Tolukuma informed family members in Port Moresby who in turn broke the sad news to Kaima. Rony, from Numboruon village, Yangoru, East Sepik, had been with Ipi Mountain Catering for the past five years, her recent posting was as supervisor of canteens at Tolukuma mine. According to relatives, she had closed shop at 3pm and was taking the day's taking to the office when she was ambushed, dying on the spot within minutes of the attack. Kumasi said the while relatives appreciated that no information of the killing must be made public while police investigations were continuing, they had the right to know whether lack of security personnel at the mine site for non-mining facilities had led to this unfortunate incident. This was given the fact that mine had embarked on a cost-cutting exercise recently. Ipi Catering chief executive officer Scott O'Reilly yesterday confirmed the death. "The employees were set upon by armed criminals on Saturday evening following the close of trade at the company's kiosk near Tolukuma," he said. O'Reilly said police were now investigating. A PANEL of five judges of the Supreme Court hearing the reference by the Ombudsman Commission on the legality of the Constitutional Amendment Law 2008 yesterday questioned whether it had been made law yet, The National reports. Lawyers representing the State could not confirm this. The Speaker was represented by Charles Mande of Kelly Naru Lawyers while the Deputy Solicitor-General Laias Kandi represented the attorney-general. Chief Justice Sir Sa­lamo Injia asked Mande if the Constitutional Amendment Law 2008 was still a "proposed law" or had already been a "law". Mande said he was not in a position to confirm it. Justice Bernard Sakora also wanted to know whether the Speaker's instructions were from the time the amendments were debated in Parliament in 2008 or were they from the current Speaker. Mande and Kandi said they had received recent instructions from the Speaker and the Attorney-General respectively before appearing in court. The judges agreed that the two lawyers be given time to consult their clients and adjourn the matter to next Monday. THE government-appointed special investigation team which arrested Kokopo businessman Eremas Wartoto on Monday has questioned why the police released him on bail, The National reports. Sam Koim, the chairman of the investigation task-force sweep, said in a statement that Wartoto had been charged with an indictable offence and only the National Court had the jurisdiction to deal with the issue of bail in such offences and not the police. He said because of the nature of the offence, the team had requested police to refuse bail when Wartoto was arrested on Monday. He said Wartoto was brought to the Boroko police cell and locked up at 1.30pm on Monday. Koim said he was advised later that Wartoto was released on a K5,000 police bail around 4.20pm. He said as a matter of protocol and procedure, when there was a request for refusal of bail, the police officer who was exercising powers as a bail authority should first check with the investigating authorities and arresting officers to confirm the nature of the arrest. He said this was usually done to ensure that if bail was granted, then it must be conditional. "But in this case, that was not done. I as the chairman of the investigation team express great concern on how a police senior command of NCD and Central saw fit to grant bail to the prisoner of state when he was put into police custody," Koim said in the statement. Meanwhile, Wartoto failed to appear at the Waigani District Court yesterday. A lawyer representing Wartoto, from the law firm Manase and Company Lawyers told the court they were not aware that the case was scheduled for yesterday. He faces charges of misappropriating K7 million of the rehabilitation of education sector development fund belonging to the Kerevat National High School. The case is expected to be called again today. THE planned recall of parliament next Tuesday has been described as a ploy to disqualify Sir Michael Somare from the East Sepik parliamentary seat he has held for more than 40 years, The National reports. East Sepik Governor Peter Wararu stated this in a second submission delivered to the Ombudsman Commission yesterday, calling on the watchdog to use its powers to stop parliament from meeting on Sept 6. Prime Minister Peter O'Neill had announced last week that parliament would be recalled two weeks ahead of schedule to discuss important national issues. Among them were the proposed Hela and Jiwaka provinces and the reserved seats for women. Public notices to that effect were this week placed in the daily newspapers by Speaker Jeffery Nape, announcing the early recall of parliament. Wararu said in a statement last night that the national government was recalling parliament early "to force Sir Michael into a third consecutive absence from the meetings of parliament to disqualify him as member under section 104(2)(d) of the Constitution". He said this was clear from the 24 questions being added to the East Sepik provincial executives' special reference to the Supreme Court by Young & Williams Lawyers on behalf of Prime Minister Peter O'Neill and his deputy Belden Namah. "These questions focus on creating a vacancy by absenteeism of the Grand Chief from parliamentary meetings," Wararu said. The latest submission to the Ombudsman Commission was signed by Wararu, East Sepik deputy governor and chairman of assembly services-PEC Toby Samek and Angoram MP Arthur Somare. It said: "The unconstitutional recall of parliament simply adds another layer of questions on the constitutionality of the decision and action compounding the issues already in the Supreme Court. .The parliamentary meeting should remain as decided by parliament and adjourned to Sept 20, 2011." The submission argued that the bills brought forward for debate next Tuesday had appeared on the notice papers for parliament's sitting on Sept 20, and that no new facts or exceptional circumstances had been demonstrated to require an early recall of parliament. "We, again, reiterate our earlier submission that the matter is still sub-judice in the Supreme Court. "The primary question in that reference is whether the government, led by O'Neill, is constitutionally formed and legitimate. "To force a recall of parliament is an attempt to, firstly, assume and, secondly, to reinforce a claim to legitimacy which directly impinges on the primary question before the Supreme Court. "It is, therefore, contemptuous," the submission read. KOKOPO businessman Eremas Wartoto has been arrested, questioned and charged by Port Moresby police, The National reports. Wartoto has been charged with misappropriation of K7 million of rehabilitation of education sector implementation (RESI) funding for the Kerevat National High School. He confirmed with The National last night that his charges were in relation to the school RESI funds. The school funds involved more than K7 million made in two separate payments. Special task force on corruption chairman Sam Koim told The National that Wartoto was also being investigated for the K10 million development funds from National Planning and Monitoring which he used to start his airline company, Travel Air, and "a myriad of other companies he owns or controls". Wartoto, when contacted last night, said he would release a media statement today. Koim said in a statement Wartoto was the first to be arrested by the task force appointed by the NEC on Aug 11 to investigate allegations of corruption at the department involving about K2 billion. Yesterday's arrest related to more than K7 million that Wartoto had allegedly received through two separate payments for Kerevat National High School. Koim said he was charged with misappropriation under section 383(A)(91) of the Criminal Code Act. "As a matter of law, he is presumed innocent until proven guilty. He must now go through the normal criminal process in court to prove his innocence of the charge laid against him." Wartoto is expected to appear in court this week. THE national government will ensure that local level government wards in the country are given necessary machinery and vehicles to facilitate the delivery of basic services, National Planning Minister Sam Basil says, The National reports. He said last week in Kokopo, East New Britain, the government would focus on rural areas which currently lacked basic services. Basil said LLG managers needed to have bulldozers which they must operate and maintain for at least 2,000 hours, and use them during bad weather to repair roads. "This way LLGs can fix their roads and open up the market for people in rural areas," he said. He said LLG managers must each have a police car and an officer who could train 10 locals as reservists to help monitor law and order in the communities. Basil said police presence must be maintained in rural areas in light of recent land and social problems. Basil said the VSat system was important to provide communication so that LLGs could be hooked up to a fax machine and access internet to submit reports to the provincial and national governments when needed. He said a tractor would allow the LLG to plough the land for agricultural use. Basil said all these could be operated on a user-pay basis but the government must provide these equipment and vehicles so that people could enjoy better services. He urged parliamentarians to wisely use the K20 million they received from the government on sustainable projects. THE East Sepik provincial go­vernment yesterday called on the Ombudsman Commission to stop the National Executive Council from reconvening parliament next Tuesday, The National reports. In an urgent submission to Chief Ombudsman Chronox Manek, East Sepik Governor Peter Wararu said parliament's recall before the scheduled Sept 20 meeting was "sub-judice" and "contemptuous" of the Supreme Court which was presently deciding on the legitimacy of the government under Prime Minister Peter O'Neill. A five-man bench of the Supreme Court is due to hear the matter tomorrow. O'Neill announced last weekend that parliament would be recalled on Sept 6 to debate important laws pertaining to the reserved seats for women, the proposed provinces of Jiwaka and Hela and whether or not to retain provincial seats beyond 2012. Constitution to direct members of the NEC, the speaker and each member of parliament to stop the recall of parliament next Tuesday. Wararu said that an early recall of parliament was in breach of the Organic Law. He noted that when parliament adjourned on Aug 9, it had fixed its next meeting for Sept 20. He said the public notice by the speaker had relied on section 2(1)(a)(iii) of the Organic Law but, in its true context, this only applied "where there is an emergency situation arising within the meaning of Part X of the Constitution". "Parliament has fixed Sept 20 as the date for the next meeting and only parliament can change that date. PRIME Minister Peter O'Neill has promised that senior public servants, politicians and other people who have stolen millions of kina from the Department of National Planning will be investigated, charged and prosecuted, The National reports. O'Neill said an investigation into the department was almost completed and arrests were expected soon. He was speaking in Mendi last Thursday. He said mismanagement and corruption in governments departments would "bring the country down". He said an independent commission against corruption would be established next month to look into allegations of corruption. Two people have been detained and charged by police with the murder of John Hulse, the expa­triate who was killed at NapaNapa in Port Moresby on July 23, The National reports. Taita Sarah Prichard, 44, and James Paru, 50, both from Hisiu village, Bereina, Central, were charged with one count of murder each on Aug 27. Hulse, 62, who held dual US and Australian passports, died after being shot with a shotgun while trying to retrieve his lost passport from unidentified callers. NCD metropolitan commander Supt Joseph Tondop alleged that Prichard, an Australian national and the estranged wife of the deceased was implicated as the prime suspect. The police brief said Prichard went into Hulse's boat anchored at the yacht club and took his passport and that of his Cambodian girl friend before leaving. "On Saturday, July 23, at about 10am the first accused and her co-accused rang the deceased to pick up the two passports at the gate of InterOil Napa­Napa refinery where he was shot dead and was half burnt by a bush fire," the police statement said. Tondop said they had recovered the shotgun used in the killing at Paru's house in Sabama, NCD. "The two accused are detained at the Boroko police cells and will appear in court this week," Tondop said. Police have yet to find the people responsible for the death of John Sine Kaupa, the operations manager of Kuima Security Services, The National reports. NCD metropolitan commander Supt Joseph Tondop said although a few suspects had been taken in for questioning, police were yet to establish whether they were the people who had killed Kaupa. "Police have questioned two to three suspects believed to be part of the group and others are expected to be rounded up," Tondop said. He said the Chimbu and Tari community living at 9-Mile lived in close contact and they should know the identities of the killers as the incident took place in daylight. He said the NCDC law and order committee and police had arranged for a peace mediation meeting between the fighting factions at Jack Pidik Park at 10am today. He said leaders from the Tari and Chimbu community would meet to talk and restore peace in the area. Tondop said NCD Governor Powes Parkop, Moresby Northeast MP Andrew Mald and parliamentarians from Chimbu and Tari had been told of the meeting and were expected to address the leaders. Tondop said ethnic clashes had become a national issue and police alone could not solve the problem. He said tougher punishment must be issued to people involved in ethnic clashes of any sort, "so that others who are thinking of fighting will think twice". THE 23-foot dinghy that was carrying the five research scientists from the Papua New Guinea Institute of Medical Research (PNGIMR) was found in Wewak, East Sepik, over the weekend, The National reports. West New Britain provincial police commander Thomas Reu said yesterday that a photo was taken of the boat and sent to the PNGIMR and disaster officials in Kimbe. They confirmed that it was the boat that the five had got on when they went missing in Talasea waters early this month. The five are team leader Gibson Gideon from Enga, research scientists Leonard Vavana from East New Britain, George Dogoya from Lufa, Eastern Highlands, plus female members Tania Oakiva from Gulf and Lydia Petrus, from Ialibu, Southern Highlands. Reu said police had not ruled out foul play. The five scientists and the vessel's crew had planned to travel from Milimata, on the mainland, to the offshore island of Bali on Aug 1. They never arrived at their destination. He said search and rescue ope­rations were still going on. Acting West New Britain disaster director Leo Mampmani confirmed that two bodies – one female and male – had been found but their identities were yet to be verified. He said it was important to verify the identities of bodies being washed ashore because apart from the five, another seven people had gone missing in West New Britain waters in July and had not been found. "The bodies resurfacing could be anyone, which is why verification and confirmation by authorities must be undertaken," he said. The provincial disaster committee chairman and West New Britain provincial administrator Steven Raphael was expected to give a daily update. THE new location of the flood-devastated sub-district headquarter of Mumeng , which is at the Zenag chicken farm land area in Bulolo district, will be the centre of attraction when the six local level governments (LLG) in the district will stage a cultural show during the Independence weekend next month. A committee has been set in place to organise the show which is expected to lure cultural groups from as far as Waria LLG and the neighboring Menyamya district, who will be participating to show their culture. The Buang yam culture will be one of several other cultures from the district that will be exhibited. Traditional string bands without the use of musical instruments like the factory -amde guitars and ukuleles, should astonish everyone. On the commercial side of things, one of the highlights, if all goes well, will be a cross country motor cycle jaunt that will see riders taking off from Lae through the unattended short cut road to Buang from the turn off at Gabensis village. Organising committee chairman, Stanley Komuts, says companies operating within the district as well as Lae, have been given the opportunity to display their products if they so wish. Komuts said the formal Independence activities will held on Independence Day , which is Friday , September 16 while Saturday and Sunday will be occupied with cultural show exhibitions and the presentation on Sunday afternoon. He said gates will be free of charge and every cultural group, string bands and singsing groups will be rewarded for taking part. The Bulolo cultural show, if successful, will become an annual event in the district in the years to come. THE East Sepik provincial government has been urged to withdraw its Supreme Court reference challenging the legality of the election of Prime Minister Peter O'Neill on Aug 2, The National reports. The call was made by O'Neill and senior ministers of his government when he made his first trip to Mendi last Thursday and again in his native Pangia when he visited on Saturday. Capacity crowds at both locations were told that no law was broken in the election of the prime minister but specific reasons given could not be reported as the matter was pending in the Supreme Court and would be heard on Wednesday. While former prime minister Sir Michael Somare was praised and wished speedy recovery, son and former public enterprises minister Arthur Somare was singled out for the alleged wrongs of the former government. O'Neill said in Mendi: "I appeal to those who are bringing this matter to court. I know Arthur Somare wants to be prime minister but he must get the people's mandate first. "In 2012, the people will let us know if they want Arthur Somare to be prime minister. "Many of us gave his father res­pect. He must return that respect. "I appeal to Wararu (East Sepik governor). I appeal to Arthur Somare. Withdraw this case." Similar calls were made by Treasurer Don Polye, Works and Transport Minister Francis Awesa and National Capital District Go­vernor Powes Parkop. Parkop said eminent lawyers in the current government had given the issue and the law much scrutiny before the meeting on Aug 2 where parliament voted convin­cingly to remove the former go­vernment. He said: "We used the procedure of parliament. The position of the prime minister is not the property of a family or district or province. "We have the people's power to change the government. Why go to court? "If they win in court, they do not have the mandate. We will paralyse them." All speakers spoke generally of the concentration of power in the hands of a few, namely Sir Michael, his son Arthur and a few ministers who were also accused of failing to stay the advance of corruption in high places. These were offered as the main reason for the huge move against the former government. Polye said: "Corruption was growing. They were not listening to sound advice. "They sacked good leaders and held on to corrupt leaders. Business of parliament stagnated. Debate on issues was gagged. That is not democracy." Health Minister Jamie Maxtone-Graham said: "Decisions were dictated and bulldozed down our throats. Arthur Somare used the position of his father to dictate to us. "There was too much concentration of power in one family." THOUSANDS of people at the Memoi oval in Mendi town, Southern Highlands, shouted at Governor Anderson Agiru to sit down when he stood to give his speech, The National reports. The people did that in front of Prime Minister Peter O'Neill, Minister for Finance and Treasury Don Polye, Transport and Works Minister Francis Awesa, Minister for Public Services Bart Philemon, Minister for Inter-Government Relations and District Development Mark Maipakai, Health Minister Jamie Maxtone-Graham, NCD Governor Powes Parkop, Governor John Luke (Milne Bay) and local MPs. But despite the commotion, Agiru continued. The noise was so loud that people had a hard time trying to understand what he was saying. It is not known why the people shouted down Agiru. Some people later claimed Agiru had not delivered services to his people. They said Agiru and other MPs from the province had not supported O'Neill when he formed the new government. Agiru told O'Neill and his delegation to look at where they were coming from. That brought further jeers from the crowd. The crowd calmed down when the member Tari-Pori, James Marape, was called to the podium. Marape accused one or two leaders of corruption, saying it led to the downfall of the Somare government. He said it was not good to make general statements about the former regime. He urged the new government to fix roads from Mt Hagen to Lake Kopiago in Southern Highlands. 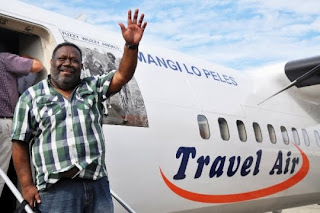 Marape said the people from Kopiago must feel safe to travel to Mendi and back. PRIME Minister Peter O'Neill told a crowd in Pangia station, Southern Highlands, on Saturday that leaders hungry for power were going to court, The National reports. During his first visit as prime minister to his electorate accompanied by Works and Transport Minister Francis Awesa and Member for Karimui-Nomane Posi Menai, O'Neill told the people he was not hungry for power. O'Neill said the government was changed because his team wanted to provide services to the people. He said when former prime minister Sir Michael Somare was sick, the country was destroy­ed by a few greedy lea­ders. He said the interest of the people was never put first despite the strong economic growth over the past nine years. O'Neill said goods and services never reached people in the rural areas. He said his government would always put the interests of people first. He said the mandated leaders changed the go­vernment following due process because they had to change it for the better. O'Neill said there was no coup or weapons used to change the government. medical supplies but some of the money went missing and some medical drugs were never bought. He said such practices deprived people of better health care. He told his people that the district service improvement programme would continue. PRIME Minister Peter O'Neill was given a red carpet welcome in Mendi town, the provincial headquarters of Southern Highlands, last Thursday, The National reports. traffic onto the main road. This was the first time O'Neill visited his pro­vince as a Prime Minis­ter, accompanied by Fi­nance and Treasury Mi­nister Don Polye, Works and Transport Minister Francis Awesa, Police Minister John Boito, Public Service Minister Bart Philemon, Health Minister Jamie Maxtone-Graham, NCD Governor Powes Parkop, Milne Bay Governor John Luke, Minister for Inter-Go­vernment Relations and District Deve­lopment Mark Maipakai, Police Commissioner Tony Wagambie, chief secretary Manasupe Zu­renuoc and a media contingent from Port Moresby. They arrived in a chartered Air Niugini aircraft. SHP Governor Anderson Agiru, Francis Potape, John Kekeno, Philemon Embel, and James Lagea were at the airport to receive O'Neill and his delegation. Mendi MP Isaac Joseph was absent. Singsing groups from the highlands waited at the airport to welcome O'Neill and his party. Police and Correctional Services officers provided a combined guard of honour at the airport before O'Neill was escorted to the Memoi oval where he addressed a large crowd. LAWYERS for the parties involved in the court case on the removal of the financial powers of the East Sepik provincial government by the Ministry of Finance and Treasury have verbally agreed to withdraw the proceeding this week, The National reports. This followed an affidavit filed last Thursday by Solicitor-General Neville Devete that there was no legal instrument in place to effectively legalise the removal of financial powers of the East Sepik government. Devete's affidavit said: "I am instructed that there are no National Executive Council or ministerial decisions to withdraw the financial powers of the East Sepik provincial government. "I am instructed that the allegations that the financial powers of the ESPG have been removed are an outright lie. "I am further instructed that the treasurer and MP Don Polye, on Aug 12, by an internal memo, requested the acting secretary for Finance to prepare necessary instruments that may become relevant to effecting the withdrawal of financial powers for two provincial governments." The two included the East Sepik and Morobe provincial governments. Following this, government lawyers wrote to the East Sepik government asking it to withdraw the proceedings on the basis that the proceeding was "mere speculation" and had no basis. Lawyer for the East Sepik government, Rimbink Pato, of Steels Lawyer, said last Thursday he would advise his clients to withdraw the proceedings but that had yet to be done. Last Thursday, the parties waited to be heard in court, however, presiding judge Justice Ambeng Kandakasi was not available. Last Wednesday, Kandakasi told the East Sepik government he would not entertain further hearing on the matter until there were legal documents presented to him proving that the government's powers were indeed "withdrawn". THE government's declaration of Aug 26 as National Repentance Day was fulfilled by Christians who gathered to pray for the country, The National reports. Christians in the nation's capital gathered at the Rev Sioni Kami Memorial church in Gordon to take part in the National Repentance Day last Friday. The programme included praise and worship, thanksgiving prayers by representatives of 20 provinces, national leaders' special prayer and repentance, church leaders and NGOs' special prayer and Bible readings. Other prayer programmes were held at Badili, Kaugere, Sabama, Manu, Hohola, Tokarara, Waigani, Gerehu High School, the Jack Pidik oval and churches at 8-Mile, 9-Mile and 17-Mile. The day saw many Christians repent and pray for good governance and a prosperous future for the nation. PUBLIC Enterprises Minister Sir Mekere Morauta is indulging in lies and half-truths in attacking the role of former Independent Public Business Corporation managing director Glenn Blake, Arthur Somare said, The National reports. "It is totally unbecoming of a former prime minister to stoop to these levels," the Angoram MP said. "Just over a week ago, he told the nation Blake had resigned but his story has now changed to a termination exercise by the National Executive Council. "Blake's terms and conditions as the MD for IPBC were approved by the IPBC board and subsequently endorsed by the Salary and Conditions Monitoring Committee. "It was then reviewed and approved by the office of the State Solicitor before being forwarded to the governor-general for signing. These are facts that can easily be checked. "Sir Mekere lied before about the so-called resignation of Blake. He is now lying about Blake's contract as MD, knowing very well that all expected processes have been followed. "IPBC, which manages the Government Business Trust, has been one of only 10 government departments and government enterprises that received endorsement of its 2010 accounts by the auditor-general and Parliament's Public Accounts Committee – public acknowledgment of the good governance shown by Blake. "Sir Mekere is indulging in half-truths in blaming Blake for the reported loss of K31 million in Lehman Brothers. "The investment involved a management decision to place funds, which previously only earned 2% annually, in PNG 30 Series 3 Notes that attracted an average interest rate of 8.5%." Sir Mekere said in a televised interview that IPBC was staffed by "refugees" from the Department of National Planning even though none of its 25 staff were from National Planning. Somare said the so-called "refugees" referred to by Sir Mekere "are young and highly qualified Papua New Guineans who have played an important role in assisting IPBC and the SOEs to engineer the turnaround that has occurred in recent years". "When he left office in 2002 and passed on the biggest ever budget deficit in the nation's history, Sir Mekere left the SOEs in such a parlous condition that two of them – PNG Power and Post PNG – had become totally insolvent. PNG Power and Post PNG today, like other SOEs, are robust and well run organisations that we can all be proud of." THE mining and petroleum industry has since last year seen 30,000 people employed directly, as well as project employees, contractors and exploration team members, The National reports. Speaking at the National Development Forum on employment creation in Port Moresby last Thursday, Papua New Guinea Chamber of Mines and Petroleum executive director Greg Anderson said it increased to 18,000 in 2006 from 12,000 in 2004. He said for exploration purposes, a "large numbers of village people are employed across much of the country". "Small scale mining employs between 60 and 80,000 artisanal and grassroots alluvial miners." Anderson said the contribution of mining and petroleum to downstream business and employment opportunities in associated industries, contractors, suppliers and retailers had not been quantified but was estimated to have a multiplier of the order of four to five times. He said the large number of technical manpower being trained in PNG was generated from the industry, especially in apprentices, trade and graduate trainees, overseas courses, university sponsorship and school scholarships. Anderson said through ro­yal­ty payments and other benefits derived from resource deve­lopments in the mining and petroleum sector, "most of these monies are then spent on education and training for the skilled manpower they needed". He said the benefits provided by the resource projects were diverse and substantial and included taxes as in company tax, royalty, tax credit scheme, DWT, salary and wages tax, duties. "The benefit distribution then goes to host communities and provinces as equity and royal­ty payments, compensation, employment, business and agri­culture development, health, community facilities and other infrastructure. "In Western, the tax credit scheme has led to the development of a new provincial go­vernment building, which is a success in itself. "It has begun to construct jetties in Lower and Middle Fly River, as well as the Porgera Joint Venture (PJV) Law and Justice Initiative in the Por­gera-Lagaip district and the Oil Search health and education programme," he said. Ok Tedi Mining Ltd has spent K213 million since 1997 and in 2010 spent K46.8 million, while PJV has spent K130 million on TCS projects. He said with the good environment for investment in the industry, "close to five new opportunities have arisen in the mining sector with the Solwara 1, Frieda River, Wafi-Golpu, Yandera and Woodlark pro­jects under way and they will be needing more manpower". This includes the three opportunities in the InterOil condensate liquid stripping and LNG project, Horizon Stanley Liquid Stripping/Gas project and the Western gas aggregation and offshore Pandora projects. BEGINNING next Wednesday, there will be changes to Air Niugini's international and domestic schedules, the airline says, The National reports. This is to allow for the increase in frequencies and capacity of the international schedule to the high demand on domestic routes. There will be an increase in capacity on the Port Moresby-Lae route, with five daily flights from Monday to Friday and four daily services on Saturday and Sunday. Mt Hagen flights will increase to four daily during weekdays and three during weekends. The Tabubil and Kiunga service on Monday and Tuesday will combine and the Wednesday service from Tabubil to Mt Hagen will be via Kiunga. Other domestic schedule changes include the reinstatement of the Port Moresby-Rabaul-Kavieng service as reflected in flight numbers PX272 and PX273; renumbering of the Port Moresby-Popendetta flight to PX852/PX853; Port Moresby-Madang-Manus on Sunday and return on Wednesday is replaced by Port Moresby-Rabaul-Manus on Tuesday and back on Thursday. These changes are made to connect with the Lae-Port Moresby and Port Moresby-Lae flights. The Q400 services to Goroka, Gurney and Hoskins will be operated by the Dash8 300 series aircraft. Air Niugini freighter service is reinstated in the revised schedule to provide the airline's corporate clients with efficient cargo movement. The international schedule changes include as advised earlier the suspension of the Wednesday's service to Narita, Japan, leaving only the Saturday flight. The Thursday flight to Hong Kong will operate on Wednesday while the return flight to Port Moresby will depart Hong Kong on Thursday morning with scheduled arrival into Port Moresby at 3.45pm. The separate Sunday flights to Brisbane and Sydney will be combined and depart at 1.30pm while the return flight on Monday will operate directly from Sydney. Brisbane will be serviced as per the current schedule. The Thursday afternoon flight to Brisbane will be re-timed to an earlier departure at 3.30pm to allow Australian domestic connections. The F100 service to Brisbane on Tuesday, Thursday and Sunday will be withdrawn while services to Cairns to Tuesday, Wednesday, Thursday and Sunday will be operated by the Q400. Cairns overnight flights on Friday and Sunday will be operated by the Q400 aircraft. THE opening of two Australian visa application centres in Port Moresby and Lae will result in faster processing of applications, Australian High Commissioner Ian Kemish said, The National reports. He said it demonstrated the Australian government's commitment to high-quality service in the region. Kemish announced last Thursday that visa lodgement hours would be between 8.30am-4.30pm on weekdays, almost double the existing times. He said phone lines would be open to handle questions and enquiries from travellers from 8.30am-7pm weekdays. "We have listened to the feedback from our clients, and I am pleased to announce the establishment of two Australian visa application centres in PNG," he said. The changes are possible because PNG has been chosen as the first country in the Pacific where Australia will introduce its new service delivery partner (SDP) arrangements. The use of an SDP in other overseas locations has provided benefits, including improved client services and processing efficiencies. Other services will include SMS alert service, internet kiosks, photocopying and the issuing of passport photographs. "As Australia's closest neighbour and the largest Pacific island country, it is only right that it is here that Australia looks to improve our visa processing systems in the Pacific," Kemish said. "Work on new shop fronts is already under way, with doors expected to open in Port Moresby and Lae between September and October. "Staff at the new centres will be trained to a professional standard and applicants' personal information will be protected in line with Australia's privacy rules. "All applications will continue to be assessed and decided by the visa and immigration office at the Australian High Commission in accordance with migration legislation and policy. "The new arrangements will not affect official visa applications (those accompanied by third person notes from the PNG government). These will continue to be accepted at the high commission," Kemish said. Known for centuries as 'the tree of life' because it has so many useful products, it seems unlikely that the coconut could have any new ones still to offer. But it does – and what's more, it's almost as if the tree has been saving them for the 21st century. Because these new products may be able to help us fight some of today's biggest health problems. Coconut flour is one of them. Made by milling the dry, pressed coconut flesh after the oil has been extracted, the flour is gluten-free and grain-free, offering a flour alternative to anyone with these allergies. It is also high in fibre – in fact, it has more fibre than any other kind of flour. It is well known that a high-fibre diet is very good for the intestine, can help manage diabetes, and protects against heart disease and some forms of cancer. Coconut flour works particularly well in sweet recipes like cakes, muffins and pancakes – and as a bonus it is naturally sweet so you don't have to add as much sugar as with ordinary flour. It can also be used with good results in some savoury recipes like soups and sauces, and different kinds of bread, from pizza base to roti. If you can't tolerate gluten or grains, some recipes, for example those for some muffins and cakes, work with 100% coconut flour. For others who just want healthier eating, substituting 10–30% of the wheat flour with coconut flour gives good results. You can find many recipes on the Internet – search for 'coconut flour recipes'. But here's the catch. While coconut flour can be bought in health food stores in Europe, the US, Australia and New Zealand, it isn't currently available in Pacific stores. 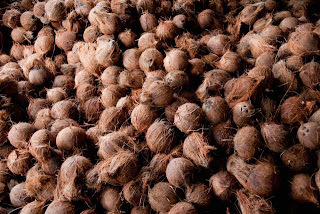 The raw material is definitely available – increasingly so as the virgin coconut industry takes off. Enthusiasts are beginning to ask suppliers to make this flour available in Pacific stores. Coconut sugar and coconut syrup are sweeteners that are familiar in Kiribati and Tuvalu – and also the islands of Rabi and Kioa in Fiji, where people from these countries have made their home – but, surprisingly, not in the other Pacific Islands. These products are made not from the nut but from the sweet sap of the flower. Known as 'toddy', this is boiled down into syrup, or boiled further until it crystallises and can be ground into sugar. 'Coconut sugar and syrup are sweeteners with a low glycemic index, which means they are very helpful for people managing diabetes and those who are trying to control their weight,' says Mr Kete. 'They have a great taste, and are also high in minerals such as potassium, magnesium, zinc and iron", he adds. 'These are natural and healthy sweeteners.' However, like coconut flour, these products are not yet commercially available in the Pacific. This may soon change, however. Fijian entrepreneur Peni Drodrolagi has plans to import these products from Kiribati and Tuvalu. 'If we can build a market for these sweeteners, then the next stage will be to start producing them here in Fiji,' he says. Eventually, he believes, these could become export products, boosting Fiji's economy. 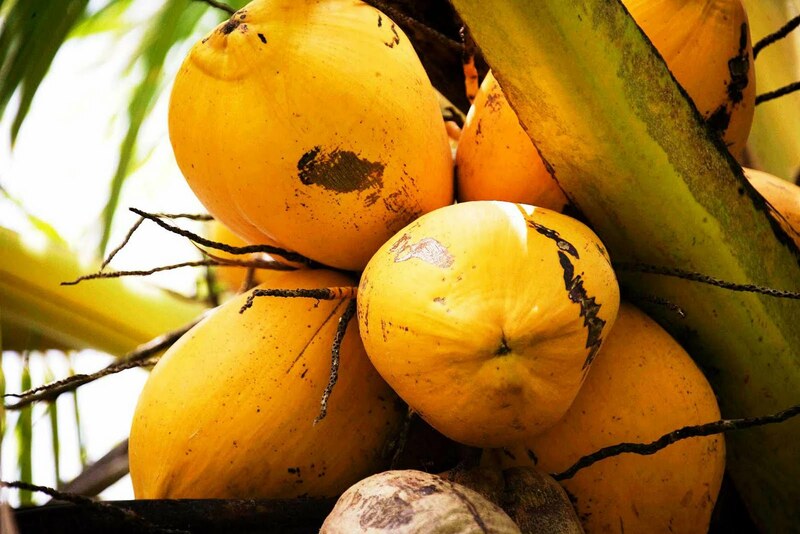 One final product – coconut water – is as old as coconuts themselves. What is new, though, is its use as a health and sports drink. Potassium and essential electrolytes are the 'magic' ingredients that are thought to enhance performance and recovery. Coconut water has much more of these than manufactured sports drinks, without any of the artificial additives. As coconut water takes the world by storm, we may soon see Pacific coconut water conveniently packaged and on our supermarket shelves. And again, that could be the first step to a new export for the region. 'As we try to eat both more healthily and locally, these products would be a welcome addition to our shops,' says Kete. 'Like virgin coconut oil, they can easily be produced in small-scale community-based industries. We in the cities will get locally produced health foods, and remote island communities will get much-needed income.' Surely that's a win–win situation. Anne Moorhead is a science writer and editor. She was commissioned by the European Union-funded Facilitating Agricultural Commodity Trade (FACT) project for this series of articles on virgin coconut oil. Implemented by the Secretariat of the Pacific Community (SPC), the FACT project works to increase the volume, value and diversity of Pacific Island agricultural and forestry export products. Vuna village, at the southern end of Taveuni Island, is a typical Fijian village. The colourful houses sit neatly beside the lagoon, while coconut plantations stretch inland into the distance. In the village, kids play while adults fish or tend their dalo fields. It is a scene repeated across many islands of Fiji. But Vuna has something most Fijian villages do not have, which is making a big difference to the people's lives and livelihoods. It has a coconut oil mill. Set up in 2006 by Origins Pacific Limited, the mill employs eight women and two men from the village. They and their families now have regular income, and about 17 children are in full-time school as a direct result. They no longer depend on credit at the village store to buy their sugar, flour and other essentials, and all can now afford electricity in their homes. "Every week I have some money," says Misa Likuvoivoi, who works at the mill. "With farming it took nine months before I earned anything. I can now pay the school fees for my two daughters, and buy their schoolbooks." "The factory really helps us,' adds Leba Vosaicake, who works as supervisor in the mill. "It gives us steady income, which we can't get from farming or fishing." Community-based oil production means that the people get a fair deal for their resources and their work. By processing the oil on Taveuni, the value of each coconut to the community increases from just eight cents (if it was sold for copra) to 45 cents. 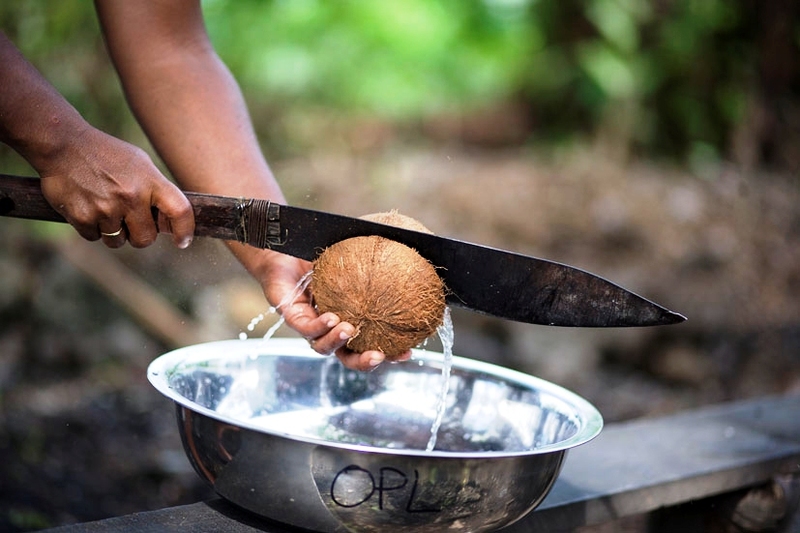 As well as the mill workers who draw weekly wages, suppliers who select and bring the best coconuts to the mill for processing also receive a premium. Peni Drodrolagi and Bole Digitaki are the directors of Origins Pacific. "We produce some of the finest, most natural virgin coconut oil in the world," says Mr Drodrolagi. "And the bonus is, because we use simple technology, the mills can easily be run by the communities themselves." Community support and participation have been vital to the success of this enterprise. "The chiefs and people have shared our vision and supported this mill from the beginning," says Mr Drodrolagi. Origins has a second mill in Vunuku village on Moala Island in the Lau Group and plans to build more, on other islands, as the demand for virgin coconut oil increases. "The market for cosmetics based on virgin coconut oil is already fairly well-developed, but the market for virgin coconut oil as an edible oil is still underdeveloped," explains Mr Drodrolagi. "However, as the health and nutritional benefits of this oil become better known, we are expecting to see an increased demand, both in Fiji and overseas." Studies have shown that virgin coconut oil in the diet may help protect against heart disease, cancer, diabetes and many other 'lifestyle' diseases. It can also help fight infections caused by both bacteria and viruses due to the high concentration of a fatty acid called lauric acid. There are also claims it can help with weight loss through stimulating the thyroid which speeds up metabolism. It is easy to replace other cooking oils and fats with virgin coconut oil, for general frying or whenever a recipe calls for butter or margarine. Because of its delicate nutty flavour it makes delicious cakes and cookies. It also works very well in fruit shakes and smoothies. Origins Pacific has been selling its virgin coconut oil through supermarkets in the Fijian capital Suva and has seen sales triple. "People are used to buying cheap, imported vegetable oils, but when they understand the benefits of virgin coconut oil, they realise it is worth the higher price," says Mr Drodrolagi. "We hope consumers will also appreciate the fair trade aspects, and that they are supporting rural communities when they buy this oil." Origins Pacific is currently working to get official fair trade accreditation for its products. As the demand for virgin coconut oil increases, there will be no shortage of communities volunteering to provide a home for the next coconut oil mill. "Shipping routes are key," says Mr Drodrolagi. "Once the oil has been produced, we need to ship it back to Suva for bottling and selling. The Lomaiviti Group and Southern Lau Group are probably where we will go next, for that reason." For islands with few income-generating opportunities, a coconut oil mill will come as a blessing. Food security is unquestionably one of the most important issues for the region. This series of articles is about coconuts and coconut products – so how can they contribute to food security? You may be surprised to learn that there are quite a few ways. Food security is not simply a case of having enough to eat. It means having enough food that is nutritious and healthy, and having such food available even when there are challenges to food systems, such as cyclones or price hikes. With this definition of food security, coconuts begin to stand out as one of the Pacific's most important food security crops. 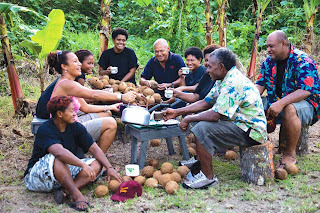 'Now that the myth about coconut oil being unhealthy has been debunked, we can say without doubt that coconuts are one of the most nutritious and healthy natural foods available,' says Dr Jimaima Lako, a food scientist at the University of the South Pacific. From coconut water, which has high levels of vitamins and minerals, to the fibre-rich coconut flesh, to virgin coconut oil, a cooking oil that seems to have numerous health benefits, the coconut excels as a nutritious food. Combine coconut with fish, add a green leafy vegetable and perhaps a portion of yam or taro, and you have one of the most nutritionally balanced meals available. In other words, traditional island eating is about as healthy a diet as you'll find. Unfortunately, it is fast being replaced by one of the unhealthiest diets in the world, based on low-quality imported foods and junk foods. The results are plain to see: soaring levels of diabetes, heart disease and obesity among Pacific Island peoples. The challenges to food systems are coming thick and fast. Climate change is a critical one – sea levels are set to rise, causing saltwater inundation of coastal farmlands, and more frequent and more intense weather events are also predicted. Which tree can withstand cyclones, tidal surges and tsunamis, and still deliver its fruit (or rather, its nut)? Coconuts protect our coastlines and also shelter more vulnerable crops against sea and weather. There's no doubt that coconuts are part of the Pacific Islands' frontline defence against climate change. If we don't grow our own food, we buy it, and food security can simply mean having enough money to buy healthy, nutritious food. For rural communities on small islands there are few opportunities for earning money – but coconuts are beginning to offer some new ones. As virgin coconut oil begins to be recognised for its exceptional health-giving properties, as well as its cosmetic uses, the market for this product is expanding in the Pacific region and beyond. Managed well, with fair trade principles, everyone can benefit. Coconut water is another product that seems poised to take the world by storm. 'Coconut water: the new Coke?' is the headline of an online article (on Stuff.co.nz). There are clearly opportunities to be seized. 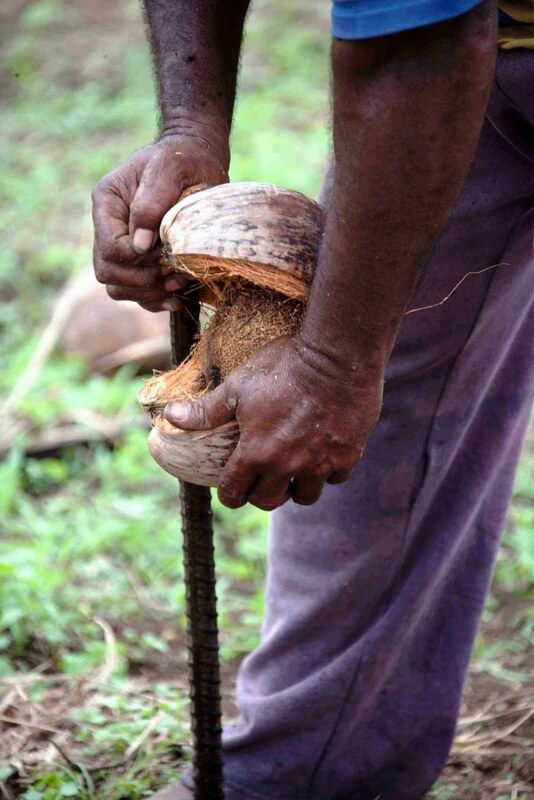 In Fiji, the government intends to seize the opportunities that coconuts offer. The government is beginning an intensive effort to revitalise the coconut industry. According to Joketani Cokanasiga, Minister for Primary Industries, the drive includes planting a million new coconut trees. Developing the biofuel industry is one of the government's incentives – there is huge potential to replace expensive imported fuels with locally produced, environmentally friendly fuel from low-grade coconut oil. Imagine islands powered by their own coconut diesel, where the profits from producing the fuel stay in the community, and everyone benefits from cheaper transport and electricity. The dream may not be so far away. Yet biofuel is only one of the government's incentives. The minister also believes that value-added coconut products, like virgin coconut oil, could become significant exports for Fiji, perhaps even rivalling sugar. The country as a whole will benefit – and so too will small rural producers. Coconut trees and coconuts are at the heart of Pacific Island life, and as we face new challenges to food systems, they will not let us down. Of course, coconuts alone cannot solve all the problems surrounding food security in the region, but they are an essential part of the solution. The coconut oil cure – fact or fiction? Could the humble coconut hold the answer to cancer, AIDS and some other serious diseases? These claims have been made for virgin coconut oil, but what is the truth? This article, the second in a series about virgin coconut oil, explores the science behind the claims to find out what this so-called 'miracle oil' can really do for your health. There seems to be no doubt that the chemical composition of coconut oil – when unrefined or 'virgin' – gives it a host of beneficial properties. According to scientists, one reason for this is the high concentration of medium-chain fatty acids in coconut oil, and in particular one called lauric acid. Lauric acid converts to monolaurin in the body, and monolaurin is also a critical ingredient of breastmilk. In breastmilk it helps protects babies from infection, and it seems that monolaurin derived from coconut oil works in the same way. There are very few foods that contain lauric acid, so most people do not benefit from monolaurin after the first few months of their lives. Dr Mary Enig, a biochemist and probably the world's leading expert on coconut oil, writes, 'Monolaurin inhibits the growth of many pathogenic microorganisms.' One of the ways it does this is by disrupting the lipid membranes of viruses, and Enig lists HIV, herpes and influenza as examples of viruses that have been shown to be destroyed by monolaurin. She also describes similar effects against disease-causing bacteria, including 'superbugs' such as antibiotic-resistant 'golden staph' (Staphylococcus aureus). So coconut oil, it seems, has the potential to prevent and perhaps treat certain illnesses caused by infection. A few medical practitioners in Fiji and New Zealand have been recommending virgin coconut oil to their patients for several years, and they believe this potential can become reality. 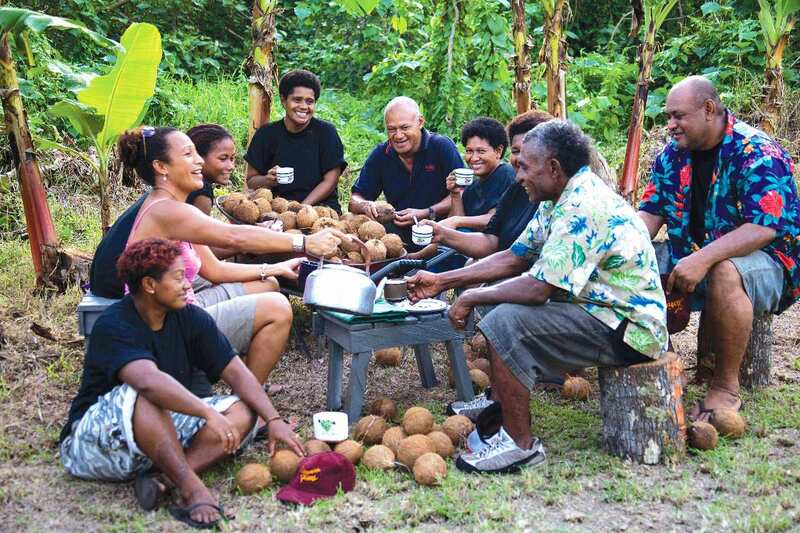 One of them, Dr Epeli Nailaitakau of Fiji says, 'Diabetic abscesses are one of the hardest infections to treat – but I have seen them heal when patients follow the recommended diet.' The diet he recommends is based on raw foods, mainly fruits and vegetables, as well as virgin coconut oil. He believes that this natural diet can have powerful results, and has himself trialled it with HIV-positive patients. 'After just a few weeks on the diet, their CD4 cell counts improved,' he says. Less controversial perhaps are the benefits of coconut oil for so-called lifestyle diseases. Take heart disease for example. The confusion over whether coconut oil (as a saturated fat) might contribute to heart disease has now been clarified. The answer is: it does not. In fact, it is now clear that the opposite is true – some studies show that people who have a lot of coconut oil, and other coconut products, in their diet are less likely to suffer from heart disease. Again, lauric acid is one of the reasons – it acts to reduce LDL (bad) cholesterol, and to increase HDL (good) cholesterol in the blood. Some doctors are now recommending coconut oil to both prevent and treat heart disease. Diabetes and obesity are two more lifestyle diseases that coconut oil can treat. Diabetes is essentially a problem with the regulation of sugar in the blood, and certain foods add to the problem by causing big swings in blood sugar level. Coconut oil, however, helps to regulate blood sugar while at the same time providing energy. The evidence is mounting that doctors should be recommending that their diabetic patients use coconut oil instead of other oils, as part of a balanced diet and along with regular exercise. Using oil or fat to promote weight loss seems counterintuitive, yet there is scientific evidence that it works. We will look at this in more detail in a later article on weight loss – but again, the medium chain fatty acids are the key. These are rapidly absorbed and not converted to stored fat in the body. But what about cancer? The temptation to seek 'natural' cures is high when faced with conventional treatments (surgery, radiotherapy and chemotherapy), and this has led to a plethora of 'discoveries', most of which offer little more than false hope. Does virgin coconut oil offer more than this? Dr Nailatikau is convinced that his recommended diet can have positive results in cancer patients. 'It boosts the immune system, and so helps the body fight the cancer,' he says. It is known that some other cooking oils which are less stable when heated can cause cell damage that may lead to cancer, so replacing these with coconut oil is also a way to reduce the risk of cancer. We do not claim virgin coconut oil is a cure for cancer, or other major illnesses. However there does seem to be a growing body of evidence that it has at least a protective role against many diseases. Medical science would do well to look carefully at this natural product and delve deeper into its biochemistry. The Asian Pacific Coconut Community has a proposal to conduct clinical studies in order to validate the above anecdotal medical testimonies. Virgin coconut oil has a natural nutty flavour which makes it ideal for frying meat, vegetables, pancakes, etc., or it can be used in curries, soups, sauces and casseroles. Whenever a recipe calls for butter, margarine or oil, virgin coconut oil can be used. It makes lovely baked goods such as cakes, cookies and muffins; and it can also be added to smoothies, shakes, warm milky drinks, oatmeal and cereals, giving a delicious coconut flavour. What can you tell a Pacific Islander about coconuts? Surely, after centuries of building their lives around the 'tree of life', they know everything there is to know. But in fact, there is a well-kept secret that not only islanders but also the rest of the world should know. Recent research has shown that virgin coconut oil, a pure derivative from fresh coconuts, has health-giving properties. In fact, some are calling it a 'miracle oil'. Of course, we have all heard of miracle foods before, but this time science is providing hard evidence that virgin coconut oil can protect against heart disease, cancer, diabetes, and many infections caused by bacteria and viruses. It may also help you lose weight. Of all the cooking oils commonly used around the world, including olive oil, it seems that virgin coconut oil is by far the healthiest and most nutritious. But why is this not widely-known? And worse, why do many people actually believe that coconut oil is bad for you? The answer lies in misunderstanding and misinformation. "Saturated fats were linked to raised cholesterol and heart disease in the 1950s," says Dr Epeli Nailatikau, a Fiji-based medical practitioner and Director of the Strauss Herb Company. "Coconut oil is high in saturated fats, and so it was blacklisted. But we now know that the research was flawed. The fats found in coconut oil, far from being bad for you, are extremely beneficial." Unfortunately, the damage was done; and then the US soybean and corn industry jumped on the bandwagon. Eager to capture the lucrative cooking oil market in the US, they promoted their unsaturated, 'healthy' (and American grown) oils at the expense of oils grown in the tropics. So powerful were their marketing campaigns that consumers as far away as the Pacific Islands were influenced, and switched from their home-grown and healthy coconut oil to imported oils. With imported foods of all kinds replacing traditional foods, it's no coincidence that around this time, diseases such as heart disease, obesity and diabetes started to become common in the Pacific region. Now the truth is out, and it's time to spread the word. Here are some key facts about virgin coconut oil. · Because of its chemical make-up, virgin coconut oil is very stable. This means it has the longest shelf life of any cooking oil – it won't go rancid even after a year or more on the shelf. · This chemical stability is one of the reasons coconut oil is so healthy and good for cooking. Other oils degrade into dangerous, potentially cancer-causing compounds when heated, but virgin coconut oil remains safe up to temperatures of 230°C. · Virgin coconut oil does not raise blood cholesterol levels – in fact, studies show that it improves the balance of good and bad types of cholesterol. The oil stimulates the thyroid, and this results in cholesterol being converted into beneficial anti-ageing substances, which help prevent heart disease, senility, cancer and other diseases associated with age. · Stimulating the thyroid can also speed up metabolism, which could help with weight loss. Also useful for dieters – virgin coconut oil has fewer calories than other food oils; and when eaten it is rapidly absorbed and converted into energy rather than being stored as fat. · Virgin coconut oil boosts the immune system, fights infections, aids digestion, and protects, moisturises and heals the skin and hair. · Only unrefined virgin coconut oil has these benefits. Low-quality coconut oil made from copra, which has often been 'refined, bleached and deodorised', has lost many of its health-promoting properties. This is the first of a series of articles that will tell you much more about virgin coconut oil – how and where it is produced, and how you can use it in your cooking, as an aid for weight loss, as a source of energy for sportsmen and women, and as a beauty product. We will talk to the people who know the most about virgin coconut oil, from the researchers who are uncovering the science behind its properties, to the producers who are committed to fair trade, poverty alleviation and environmental sustainability, and we'll also hear from some people who are already reaping benefits from it. Virgin coconut oil has a great deal to offer, and we believe you should know about it. In addition to its health benefits, virgin coconut oil has additional benefits for the environment and for island communities. Virgin coconut oil probably has the smallest carbon footprint of any cooking oil, as it is mainly produced by small companies or by rural smallholder farmers using low-tech systems. In addition, coconut palms are very resilient plants and will be able to help people adapt as sea levels rise and conditions change. Thus, virgin coconut oil helps doubly in the fight against climate change. Finally, the growing virgin coconut oil industry is supporting many poor communities on remote islands, where people have few opportunities for earning money. For them, the tree of life can also provide their livelihoods. Coconuts are part of the heritage of Pacific Islanders, and virgin coconut oil is a remarkable product that we can all benefit from.